The Branded TV show was a 30 minute western action series on NBC about a U.S. Cavalry Captain who is the only survivor of a battle and is, therefore, wrongly accused of cowardice and court-martialed. He is actually a hero and so honorable that he even refuses to testify against his commanding officer who was actually responsible for the wipe out of his unit. By: "Dominic Frontiere & Alan Alch"
What do you do when you're branded, and you know you're a man. You must prove, you're a man. During its first season, Branded was filmed in black & white. Then, in the second season, it was shot in color. Branded was a Mark Goodson and Bill Todman Production. It was their only weekly series. They were the kings of game shows though with hits including "What's My Line", "I've Got A Secret", "Concentration", "To Tell the Truth", "Password", "The Match Game", "Family Feud", and "The Price is Right"! Before becoming a TV star, Chuck Connors was a major league baseball player for the Chicago Cubs and he also played basketball for the Boston Celtics. In 1946, Chuck became the first NBA player to shatter a backboard! His 6 foot 5 inches of height might have had something to do with that! During a state visit to the U.S., U.S.S.R. Premier Leonid Brezhnev was asked if he'd like to meet any famous Americans. The only one he wanted to meet was Chuck Connors! They even became such good friends that Chuck visited Russia on several occasions! Footage from several episodes of the Branded TV show was edited into a TV movie that was titled, "Broken Sabre". It was broadcast on March 28, 1965. On episode #65 of Branded titled, "Fill No Glass for Me - Part 2", Chuck (as Jason McCord) was stripped to his waist, tied to a tree, and left to die in the boiling sun by Indians. On episode #111 of his other western series, "The Rifleman" titled, "The Vaqueros", he got exactly the same treatment (as Lucas McCain) from Mexican bandits! Chuck was also a "die hard" Republican and a close friend of President Richard Nixon. He could often be found as a guest at the White House. 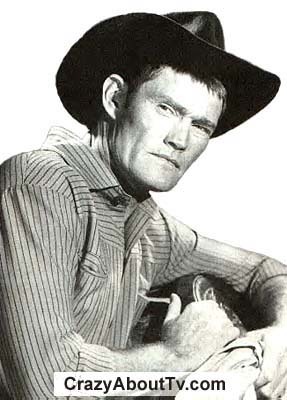 Chuck Connors got a star on the Hollywood Walk of Fame in 1985 and was inducted into the Cowboy Hall of Fame in 1991! Thank you for visiting our Branded TV show page!